You are working as ETL/ SSIS Developer. You need to write an SSIS Package that should download the file from SharePoint site. Every time you run the SSIS Package it should download the file and add date_time to it. We will be using HTTP Connection and Script Task to download the file from SharePoint. Create your SSIS Package by using BIDS or SSDT ( SQL Server Data Tools). Provide the folder in which you want to download the file. This is the variable we will be using to write expressions on it. Click on the expressions tab and then write the below expressions. Once you click on the Expression Button as shown above, paste the below expressions. 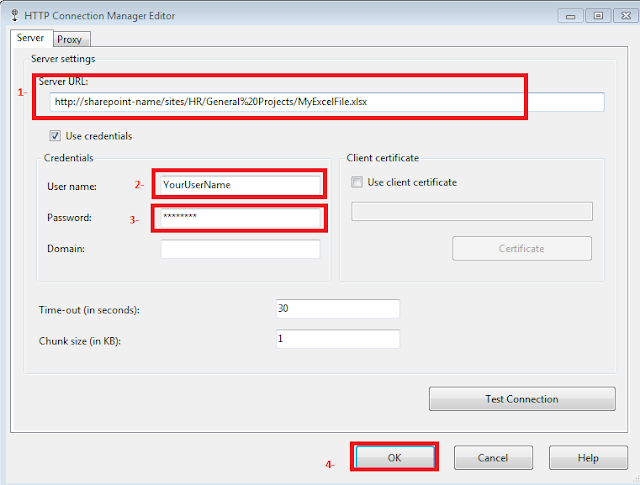 To create the HTTP Connection to SharePoint File. Go to Connection Managers Pane and then right click and then choose New Connection. To get the Server URL ( Path to file on SharePoint). You can go to SharePoint and then go to File and Right Click, Choose Properties and then you will see Address (URL) that is the Server URL you need to use in Connection above. Also provide the user name and password which has permission on the SharePoint File. Test the connection and it should be successful. A new connection should be created once you click OK. You can rename if you like,I am going to leave this as it is. Bring the Script task in Control Flow Pane and open, you need to add the variable. Save the script and close the Editor windows. Run your SSIS Package, It should download the file and add date_time to file name. Every time you will run the SSIS Package , the new file will be downloaded and date_time will be added to it. I executed the SSIS Package couple of times and you can see that the file is downloaded and date_time is added to it. You are working as SSIS Developer and you need to download the file from SharePoint on daily basis, if the file exists in the folder you want to overwrite with new file. The file name that you need to download from the SharePoint stays the same. 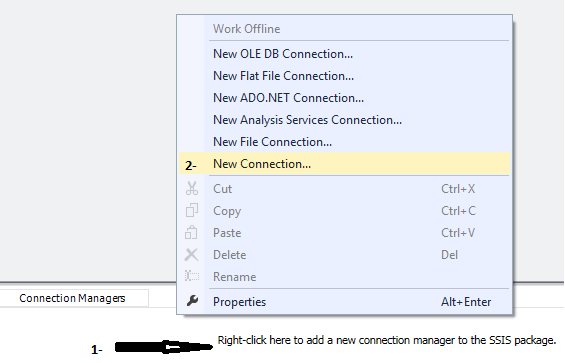 We will be using the Script Task and HTTP connection Manager in SSIS Package to download the file and write to folder in SSIS Package. Create a new SSIS Package by using BIDS or SSDT ( SQL Server Data Tools). Create a variable called FilePath where you would like to save the file on local folder. 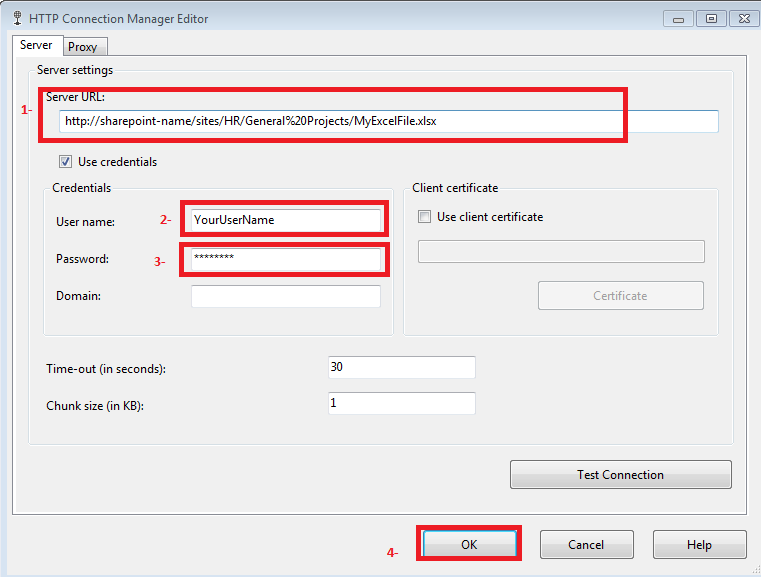 Create the HTTP Connection to SharePoint File. Go to Connection Managers Pane and then right click and then choose New Connection. Save the script and close the Editor windows. Run your SSIS Package, it should download the file. Every time you will execute the SSIS Package, it will overwrite the existing file from SharePoint file. You are working as SQL Server developer. The company you are working create a new database for each of the client with same objects such as tables/Stored Procedures. You have one stored procedure with the same name let's say dbo.LoadCustomer present in all the databases. You need to execute that Stored Procedure from multiple databases. The script can be used one time or you can also run by using SQL Server agent if has to run on schedule. We can use Cursor to loop through list of the databases in which our Stored Procedure is present and we want to execute. Below is sample script. Please change the @SPName and filter the list of database as per your requirements. You are working as ETL Developer or an SSIS developer, you need to write an SSIS Package that should be able to delete all the old files from a folder and just leave the current day files. We can get the Date Created for the file and if it is created today we will not delete , otherwise we will delete the file. Step 2: Create a variable called SourceFolder and provide the path for folder in which your files exists. Bring the script Task to the Control Flow pane and add SourceFolder variable to it as shown below. Click on Edit Script and then use the page the below script. Save the script and then close the Editor window. Your SSIS Package is ready. Execute and it should delete all the old files from a folder and leave only current day files. Noticed, my SSIS Package has deleted all the files and I am left with only current day files in my folder.